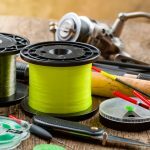 If you are new to fishing, you might notice that some people use a different type of fishing line on the end of their main fishing line. 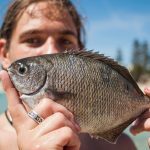 The idea might sound a little strange to the newbie but the fact is this is one of the most basic tactics used in fishing and can considerable increase your fishing success rates. This line at the business end of the main fishing line is known as leader line. It’s a whole separate length of fishing line to which your rig is tied. The main line and the leader line are normally connected by using a swivel. There are a couple of reasons for taking advantage of leader line. Leader line can be used as it offers increased protection against abrasion, both from the environment and from the sharp teeth of fish. Another reason why leader line is used is because some fishing lines are very visible to fish. A leader line can be used so that it is harder for fish to the see the fishing line. 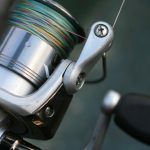 For example, you may want to use a braid fishing line that isn’t that resistant to abrasion in an environment where you need a line that can handle it. In that case, you should go with a leader line that offers you a little more protection. Generally speaking, there are 2 main types of leader line but there are also many other variations of leader line for specific uses. For example, wire leader line is available for targeting fish with very sharp teeth. 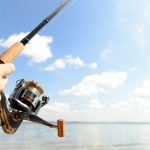 Here is a look at the 2 most common types of leader line that are most commonly used by most fishos and some of the reasons why. Ultimately, different situations call for different leader lines. This leader line is a single filament of line made of nylon, it is designed to be heavy and stiff while still offering a considerable amount of flexibility, a thinner diameter and a uniform quality. Monofilament leader is normally used because it has better abrasion resistance and it is generally quite cheap. It is important to note that monofilament leader absorbs water and sunlight. Fluorocarbon leader was expensive when it came onto the market. That is not the case today. Fluorocarbon leader is still a single filament but it is a little different to standard monofilament fishing line. It is often used because it doesn’t absorb water and it doesn’t stretch. Because it doesn’t absorb water it sinks. Fluoro leader line also allows for sunlight to shine through the line which makes it harder for fish to see. Fluoro leader line often has a higher abrasion resistance as well as a low level of stretch. Obviously, there are different reasons why you would want to use different leader line. Another example is when you are fishing in extremely clear water. You would want to use a leader that is very difficult for the fish to see. You might also want to use fluorocarbon leader when you need a line that doesn’t stretch so you can feel those smaller bites. On the other hand, if you are jerking lures to get a swimming action, you might want to go with a fluorocarbon leader that offers less stretch to help give more action. 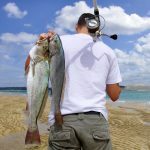 When you are trolling lures, you might want to use monofilament leader because it offers some stretch, which will help to counteract the shock when your lure gets bitten. Okay, so as it is with everything in fishing, there are as many opinions as there are fishos. 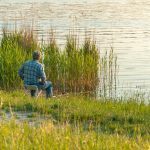 I’ve found the best way to find out what is best for my fishing is to give them a try. Thankfully, fishing line and leader line are very affordable, especially with all the deals being offered online. I love giving new leader line a try. I say, get out there, experiment and give it a go.